For FIFA and football fans, FIFA 13 is a no brainer and a must purchase. Its quality surpasses the previous instalment with improved graphics, gameplay and better control of individual elements. There's a bit of space for improvement off the ball and in the commentary, but FIFA 13 is definitely the best yet in what is always an impressive series. 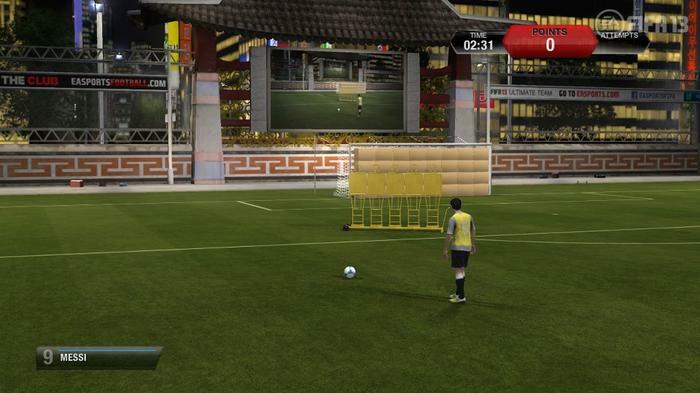 FIFA 13 creates a more immersive overall football experience than previous titles. While EA Sports has consecutively improved its FIFA title each year, the jump from FIFA 12 to 13 is definitely the biggest. The game brings back key features, such as Ultimate Team and Be A Pro, but in a far more realistic manner. Note: This review is based on FIFA 13 for the Xbox 360 and will centre around game play. Controller settings used for this review were changed between none to minimal assistance to minimise the CPU’s contribution. 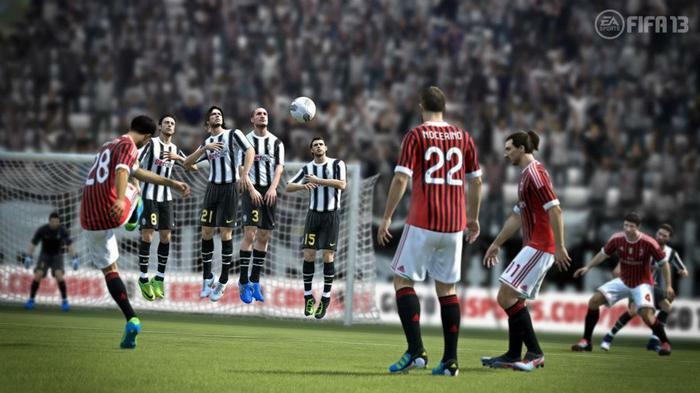 The graphical enhancements in FIFA 13 are evident in nearly all elements of the game. Essentially, everything seems to have been revised and touched up. The designs and colours are more vibrant and smooth without being cartoon-like. The realism is a real highlight, with much smoother edges on players. Player faces could use a bit of improvement, though. While all players can be recognised, a bit of additional detail would have assisted in complementing the realism of the figures and game play, as well as removing the remaining stiffness. Another downside is stadium crowds, which remain two-dimensional, flat, and repetitive. 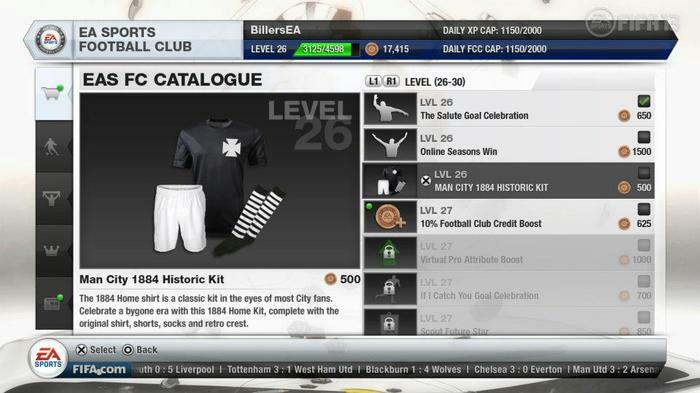 They are a slight improvement over FIFA 12, but have a way to go before they become a positive graphical element. The difference in game play and control between FIFA 13 and the previous instalment is immediately noticeable. Player movement is much less rigid, with each element (running, dribbling, tricking, intercepting, tackling, and so on) feeling less patterned and predictable, and far more reactive. The predictability of the CPU is decreased, too. While the AI can judge ball movement once it occurs, it no longer foresees what will happen. 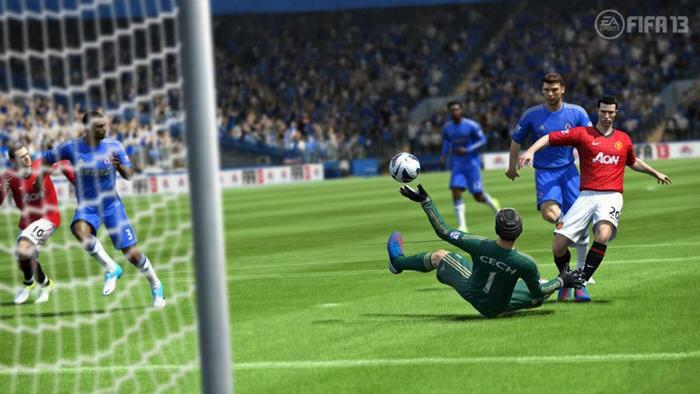 For example, when playing FIFA 12, the CPU goalkeeper would know immediately what to do once a ball was kicked, regardless of its location on the field. This always seemed too artificial and removed real-world football elements of response, intervention, and line of sight. 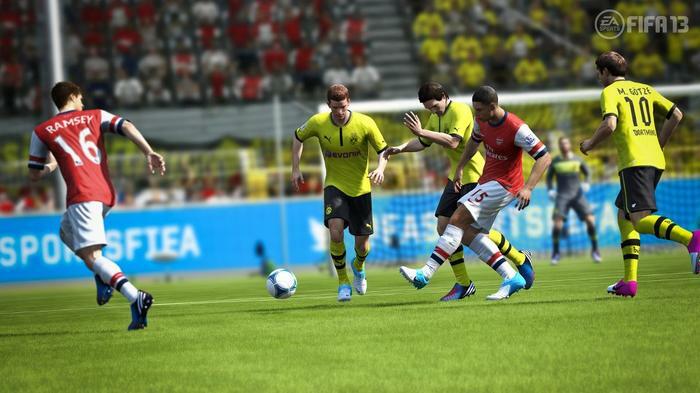 One of FIFA 13’s most attractive propositions is defending. No longer can the opponent hold down the ‘A’ button on their controller (what I like to call the ‘honing missile no-fail tackle’) and be guaranteed to end up with the ball. The ‘A’ button gets you closer to the player, but doesn’t always make the player attack the ball. With the new mechanics, defending demands much greater patience, particularly when deciding the best time to lunge in and make a tackle. This is a result of improved dribbling and ball control. EA Sports has finally made dribbling really matter. Unlike FIFA 12 and previous editions, it is now possible to successfully dribble around and between opponents, but not so much as to make tackling impossible. Essentially, success in the game is now reliant on intelligent play. One element which could use revision is the ‘assist tackle function’ (achieved by holding ‘RB’ on the controller). While it is beneficial in defence as it allows you to send a player from your team to tackle the opponent while you do something else with the player you control, it is a bit too powerful. We would have liked to see it have less of a success rate than it does, especially when in online play. Another issue are fouls when the ball is being contested. FIFA 13 does not seem to register a lot of fouls that occur when no one has possession of the ball. Difficulty is where it needs to be. Each step up in the settings presents new challenges. The CPU gains real intelligence and is far more punishing on higher levels. If you managed to spend your FIFA 12 time on legendary, you might have to fall down a notch to get a grasp of what’s going on and learn the different CPU player behaviour. First touch — Ball control is not guaranteed. Passes, kicks, headers, chesting, and interceptions make the ball end up in all sorts of places as strength of the reception is taken into account. The goalkeeper is also unable to block all shots and even when he reaches it, it could still end up in the back of the net. 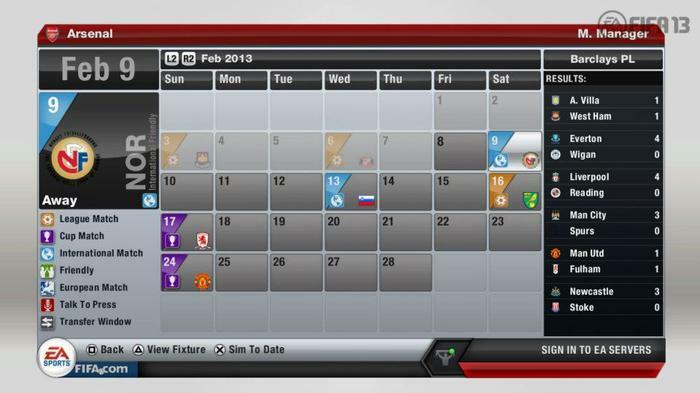 Live updates — If you are connected to the Internet, FIFA 13 will automatically update teams and players each time you enter a game mode. This means that player stats, team form and tactical formations are adjusted to match the real world. If your team played well on the weekend, key players will receive a boost. Injuries are taken into account as well — these players are still usable, but are demoted to the reserves squad for you to manually substitute in. Air balls — Performing good crosses, chipped through balls, and headers is not easier, but it's more creative and rewarding when achieved successfully (dependent on your personal controller settings, of course). Floating a ball in the air is also much more punishing on aggressive and impatient defenders. Ball contest — Players will push, pull and shove each other to get the ball. This influences the players speed and results in more accurate ball control. Ultimate team — This game mode is back and it works fantastically well, just like the previous edition. It appears that team chemistry has gained more significance. Multiplayer has returned in the form of ‘Seasons’, where you begin in division 10 and play your way up to the top. The system is straightforward and pairing is relatively quick. You are able to change the team you use and keep your current standing as well. For those who want a further challenge, there are periodic cups in which you can compete (the higher your division, the more you can enter). Although most features have been brought back, EA seems to have removed some elements of the game, and significantly altered others. ‘Player Manager’ is gone. Once you start a career, it’s one or the other. Your virtual pro’s presence in the game has also been altered. No longer do you use the same pro for everything you do. For each career you start, you must create a new pro. There doesn't seem to be any drastic adjustments to the sound of the game. The soundtrack included is, as always, a compilation of songs that you would probably never hear, but end up loving after listening to them several times. The commentary engine now includes information from your in-game experience, like reference to past games and performance by commentators. The commentary references both real world results and in-game results and there's also injury updates by a third commentator Geoff Shreeves, a real life reporter on UK channel Sky Sports. Overall, we would have liked the commentary to become a little more exciting, like in EA’s NBA games.